If you’re looking at a big woodworking project that requires a lot of precision with the nails, then you’re going to want to get your hands on a framing nailer. As the name implies, it is a nailer used for the construction of wood frames – you can also build fences, decks, and do wood siding and sheathing with these nailers. There are all kinds of possibilities. Unlike brad nailers and finish nailers which are used for more delicate projects, this is more of an all-purpose nailer that can handle big, labour intensive carpentry jobs. Getting your hands on a good framing nailer can shave hours and even days off of the amount of time you invest in your project. With that being said, a framing nailer is an important tool, so you have to make sure that you get the right one for the job. When you shop for any tool, it’s wise to know what you are dealing with, what to look for, and what your options are like. These things can help you make the right decision – and the right decision is one that makes your life easier. There are two types of framing nailers, and the needs of your job will determine which one you ought to go with. There are pneumatic nailers and cordless nailers. Consider the projects you have planned when you are trying to decide between them. 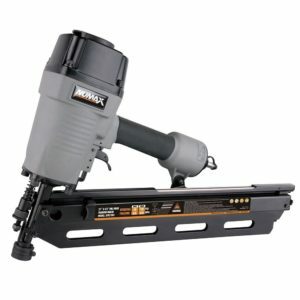 1 What is a Pneumatic Framing Nailer? 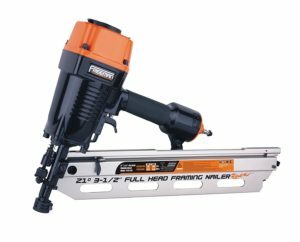 2 What is a Cordless Framing Nailer? 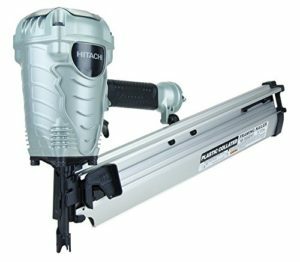 What is a Pneumatic Framing Nailer? Pneumatic nailers are powered by compressed air. You hook your air compressor up to the nailer with a hose, and the compressed air is the force that drives the nail into the wood. It’s fast, powerful, and as long as you use the right nail for the job your chances of splitting and breaking the wood are limited. In terms of power, pneumatic is the ideal choice. The power output of a pneumatic nailer is measured in Psi. Psi stands for Pounds per Square Inch and is a unit for measuring pressure, in this case, the air pressure put into each time the nailer fires. Remember, it is vital to get an air compressor that is compatible with your nailer – make sure the compressor meets the minimum Psi required by the nailer to operate effectively. Most nailers have a Psi range of somewhere between 70psi-120psi. Just because something has more power, that does not make it better. Think about the type of wood you are working with, and remember that softer and weaker materials will require less power to avoid destroying them in the firing process. You need to look for a nailer that has a good range. 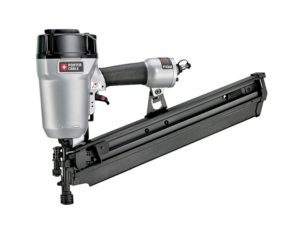 What is a Cordless Framing Nailer? A cordless nailer is battery powered, which means no cord to lug around, no air compressor to worry about, and no compressed air to have to buy. That being said, battery-powered nailers are less popular because they are not as powerful or efficient, and it’s inconvenient to use them for long jobs because you have to work around the fact that the battery may die before the job is finished. That being said, there are quite a few good reasons for why you’d want to go cordless when it comes to choosing a nailer. For some projects, space might be too tight to accommodate a cord and air compressor. It might be too inconvenient to manage the nailer and its attachments when you’re getting to those hard to reach spots. You may be in need of something that is far more portable than the pneumatic nailer. When it comes to a cordless nailer, you need to pay attention to the battery – make sure you’re getting something reliable, that has good longevity, otherwise, you’ll be kicking yourself when it dies on you at the worst possible moment. The design of the tool is vital to consider. You must be smart about what you get. Choose function over aesthetics. Consider all the things that are important for the machine to fulfil your needs. This is a tool, it must assist you in doing certain jobs, not look pretty. Spend your money on something reliable, efficient, and high quality. Nailers can be pricey, so it is important to try and find something that will last you a long time. You don’t want to get one that will be burned out or busted easily. That doesn’t do you any good, especially if you do a lot of DIY projects and you need to use the nailer frequently. Durability is a priority. This thing is going to be shooting nails into wood, if your nail gun is essentially a glass cannon, it’s useless to you. One important thing to keep an eye on is how the nailer handles jams. Is the design jam-resistant? If it does jam (and the reality is that nailers DO jam sometimes), are the jams relatively easy to clear without additional tools? If your nailer jams, you want to be able to safely clear the jam with your hands in a couple of seconds. You don’t want to be stuck fiddling with other tools, taking apart the machine to clear it. On that note, it’s also important to try and figure out how easy the settings on the nailer are to change. Can you switch the depth of drive and the trigger modes with the flick of a switch, or does it require tools to adjust? Can a novice alter these things with ease, or not? Simple things like this make a huge difference in how good a nailer is. A high-quality nailer is also user-friendly. Weight matters – you don’t want a bulky, heavy nailer as it will be difficult to use. You’re holding this thing up, one-handed, often for extended periods of time. Try holding a 5 pound and a 15-pound dumbbell up, and tell me which one you’d rather hang on to all day. A lighter unit will allow you use it more easily. Balance makes or breaks a nailer. If it’s not balanced, it will be difficult to handle. Finding a well-balanced unit is easy if you’re looking for the higher quality tools, but if you’re on a stringent budget, it’s something to look out for. If you’re working in the summer heat, getting a healthy sweat going, the last thing you want to deal with is your nailer slipping out of your hands. Having a nailer with a good grip is world changing. Without a solid grip on the nailer, you’ll be prone to missing or making mistakes because of your hands sliding, not to mention the risk of you dropping the tool. Try and find a nailer with a short nose – shorter nosed nailers are easier to maneuver and aim, which helps improve your accuracy tremendously. You can line the nail up with the target easily and get the perfect placement every time. There are two types of firing modes for nailers. Sequential firing mode requires you press the nose against the work area and pull the trigger for each individual nail, resulting in slow, but accurate and precise firing. Bump fire mode allows you to hold the trigger down and fire a nail each time you press the nose to the work surface, which allows you to quickly place multiple nails in a row. It’s faster, but you won’t be able to take the time to meticulously aim the nailer. Both firing modes have their merits, and there are a time and place for both. Make sure that when you get a nailer, it’s easy to switch between these firing modes and that both modes are reliable and won’t result in your nailer jamming every 5 minutes. For pneumatic nailers, being able to turn the hose 360 degrees is very handy. It can be quite frustrating to have to wrestle with the cord. Pneumatic nailers already suffer from the fact that you have to keep the air compressor close. Anything to reduce that inconvenience is a welcome sight. Now that you have a pretty good idea of what to look for in the nailer itself, but you should also pay attention to the extras that come with it. Plenty of nailers have great extra features and pieces to go along with them. A good belt hook will keep the nailer close to you, so you can use it when you need it. If you are working on high up areas where you need to be on a ladder, or you’re moving around a lot, this is a total game changer. It’s one of those things where you don’t know how good you have it until you have to make do without. Many nailers come with a protector case and safety glasses, to keep your nailer safe while storing or transporting it, and to keep your eyes safe while using it. Seriously, do not ever neglect eye safety. You only have two eyes and if something happens to them that’s that, they are gone forever and you won’t be able to see anything ever. Wear the safety goggles/glasses. A nailer shoots nails, so naturally, you should learn a little bit about the nails that your framing nailer is going to be firing. This sounds obvious, but it is something that you can overlook quite easily if you’re only looking at the nail gun and not the nails. First and foremost, you need to know what kind of nails are compatible with your nailer. Most framing nailers accommodate nails up to 3 ½ inches long, that is the standard. But double-check anyways. Think about how many nails you plan to go through. If you are working with a few dozens, then a small magazine capacity will be fine for your needs. You don’t need a massive coil magazine for your nailer, you can do a simple straight mag that holds 40 nails. But if you plan to burn through hundreds of nails for something you’re building, you won’t want to have to stop and reload all the time. You’ll want a larger capacity, to be able to keep up with the number of nails you’re using on the job. One thing that is causing some uproarious debate in the world of carpentry is the debate between clipped-head nails and round-head nails. Traditional, standard nails are round-heads. They have a complete circle at their head. Clipped-head nails do not. A clipped-head nail has a D shape at its head, instead of the circle. Clipped-head nails collate easier, which in turn means that you can have more per magazine. A magazine designed for clipped-head nails can hold up to 30% more, which means that nailers that accommodate clipped-head nails have higher capacities. The material used to collate the nails is different – primarily, round-head nails are collated with plastic. Clipped-head nails are collated with paper. This means that the material holding the nails together in the magazine is different, and there are pros and cons to each material. Plastic collated strips are durable and can withstand the elements and the hazards of the job. They are not prone to malfunction or damage, which is a major bonus. The downside to them is that when the nail is fired, debris from the strips can sometimes be ejected towards the face, or into the wood with the nail, potentially causing a mess or damaging the work area. This is no good of course. Paper collated strips are mess-free and far safer, but the material is still paper. If it gets wet, it becomes utterly useless, then you run into all sorts of malfunctions. Defenders of clipped-head nails will argue that your nailer should never get wet in the first place so this is a moot point, but it is still important to mention. The other thing is that as round-head nails are standard, some jurisdictions will have clipped-head nails prohibited in their building codes. This is especially true for disaster-prone areas like Florida, for example. In other words, you may not be allowed to use clipped-head nails depending on where you live and what your local regulations are. To find out if clipped-head nails are in violation of the code, simply ask someone at your local hardware store – they will often know the answer. If not, you can always google it or ask someone at your local city hall offices to check for you. We’re talking about framing nailers here – a framing nailer is made to build frames and do large carpentry jobs. This is different from a brad or finish nailer, which are designed to do delicate carpentry jobs with very thin pieces of wood, like trim, with very small nails. If you intend to work with very thin materials, you’ll want to go for a brad nailer instead. Brad nailers and finish nailers are very similar – the main difference is that brad nailers fire brads, tiny 18 gauge nails, and finish nailers fire 15/16 gauge nails. You would use a brad nailer for the most delicate materials, and you would use a finish nailer for thicker materials that require bigger nails with more holding power but are still too small for full-sized nails. Ideally, it would be good to have all 3 types of nailers, but if you can’t, a finish nailer is more versatile for smaller scale carpentry projects. Now that you know what is important when shopping for a nailer, consider getting one of our picks for the top 8 framing nailers on Amazon. 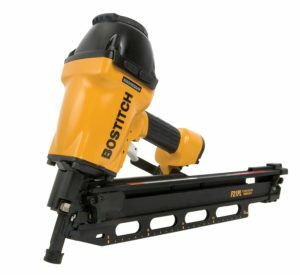 Bostitch is a brand that has dedicated itself to providing top-tier tools, including this one. There’s a reason this nailer comes with a 7-year warranty – and that reason is that the people behind this nailer absolutely expect it to last you beyond 7 years. That is durability and reliability incarnate. This tool is built with the type of longevity that you need whether you do carpentry regularly or you just do the odd job here and there. It’s a pneumatic framing nailer, so you’ll near an air compressor that can put out a psi of between 80 and 120. There’s no need to worry about battery life with this unit. The settings are easy to adjust with the Bostitch F21PL – you can set the depth of drive with a single button, and it has easy-to-switch nosepieces, to allow you to change between using plastic-collated nails and metal connector nails which use a thin gauge wire to keep the nails connected. This nailer has a fairly average weight and good balance, so you should be able to handle it quite easily. It won’t cause too much stress on your wrists, and the weight is distributed well so that it won’t feel lop-sided in your hands. The magnesium design reduces the weight while increasing the durability of the tool. This is why magnesium body tools are highly sought after. The tool comes with a simple but highly efficient rubber no-slip grip so you won’t be losing the nailer once you have it. The good grip helps to make the tool as safe as can be. Switching between sequential and bump-fire mode is easy – all you have to do is push a button and that’s that. The trigger delivers 1050 inch-pounds of driving power behind every single shot, giving you the ability to easily penetrate whatever you would use the nailer on without splitting the wood. The Bostitch comes with the interchangeable nosepieces as we mentioned before, but it also has this neat adjustable rafter hook, allowing you to hang the nailer up and keep it close by without having to set it down. Keep it right next to the work area when you have to take a break or focus on something else for a while. The Freeman framing nailer is a pneumatic, so its air-powered. It has a great 360-degree exhaust which blows air and debris both away from the workspace and away from your face, keeping potential bits from flying into your eyes, or from messing up the work area. It’s built to last and endure frequent, intensive usage. It will work whether you do carpentry professionally or as a hobby, or as just a once-in-a-while thing. No matter what, the nailer will survive what you put it through. The magnesium body provides additional durability for the nailer, which is how it can last for so long. Adjusting the depth of drive is easy – there’s a diagram right in the instructions showing you exactly where to change it in case you can’t find it yourself, and doing so allows you even more control over the project and how the nails are fired into the wood. The weight is fairly average, and this nailer features excellent balance due to its amazing ergonomic grip. You won’t be able to drop it unless you’re being careless. Even as the day goes on and the sun shines bright, it won’t be slipping out of your hands. 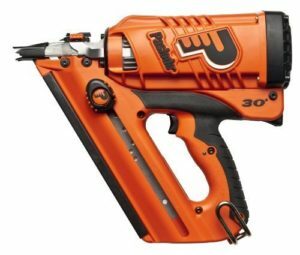 You can switch between sequential and bump-fire with ease whenever you need to, whether you want to aim slowly and precisely drive each nail in one at a time or you want to quickly fire off a dozen nails, this nailer can handle both. The Freeman PRF2190 comes with a mechanism to prevent dry-firing – shooting the nailer empty – which essentially prevents the nailer from shooting if the number of nails left in the magazine falls to an extremely low amount. The tip of the nose is a no-mar rubber tip that prevents the nailer from scratching the work surface. Without it, bump fire mode would become quite taxing on the work you’re attempting to drive nails into. The tip also has simple teeth that grip the work surface, allowing you to be very precise even while using bump-fire mode. The 1/4 inch NPT fitting for the air hose comes with an air filter and dust cap to keep the interior of the tool clear and safe from dust build-up. The lower psi range means that this tool can be used for more delicate materials. The NuMax is the third nailer in a row here made with that lightweight, tough magnesium body. It’s durable and powerful and can go through a lot. It comes with a 1-year warranty, and it’s made for people who need to use the nailer frequently. This nailer has a no-mar tip with no-slip teeth, to keep the nose securely planted against the work area without marking up the work surface. You don’t want to scratch up the work area while you’re driving nails through it, especially if you are building something like a deck where the wood may be painted or covered in a sealer, but not built around with walls. The grip is ergonomic so that when you hold it, your hand is secure – it also prevents discomfort from the vibration of the nailer when you fire it. The nailer comes with a hex wrench so you can easily adjust the depth of drive, giving you good control over it. We’d be happier with a tool-free method of changing it, but this way isn’t too much of a pain either as long as you don’t forget the hex tool. This Numax comes with an interchangeable trigger, so if you want to switch between bump fire and sequential fire, you just have to swap out the triggers quickly. You have an easy method of choosing between slow, accurate placement or quick, efficient shots. To prevent dry-firing, there is a mechanism to stop the nailer from firing once the magazine is nearly empty. Dry firing wastes air and hurts the tool, so these mechanisms are fantastic for preserving the life of the tool. The Numax SFR2190 comes with air tool oil for maintenance. Remember to keep your nailer well maintained so that it lasts longer. The nailer requires at least a 3-gallon capacity air compressor that can provide a psi of 70-115. This Paslode is the first cordless nailer to appear on this list, and this one has earned its place. It’s great enough to stand up next to the best pneumatic nailers on the market. It uses a lithium-ion battery that has a long life, lasting for a good long while. It can drive up to 6000 nails per charge, however, you will also need a fuel cell to use this nailer. Paslode 902600 CF325Li is made to be perfectly portable. It goes everywhere with you, from the tightest corners to the tallest reaches, it’s effectively right there at your hip all the time. To keep it right there, where you need it, there is a heavy duty rafter/belt hook so it’s always right where you need it. The nose piece is versatile, allowing you to shoot nails even at odd angles, so you can aim this nailer however you need to, to get to the hardest areas to hit. 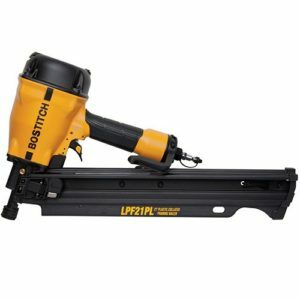 The battery can be quickly charged, reaching a full charge within an hour – and even just charging the nailer for 2 minutes will allow you to drive in an additional 200 nails. It’s a lightweight, well-balanced nailer. Even with the battery, it only clocks in at 7.25 pounds, which is great. The frame is tough, able to handle the stresses of a job. You can use it in the summer heat, or even in the dead of winter if you need to do some winter carpentry. It can operate in the cold temperatures as easily as the hot. The Porter-Cable FR350A framing nailer has a simple, user-friendly design that is both sleek and easy to use and understand. The trigger is selective, you can just quick switch between bump fire and sequential fire modes. You can adjust the depth of drive without any additional tools, with detents to help you get the best settings. The ease of use extends to the balance of the unit. It’s perfectly balanced to allow you to drive nails in with precision and consistency. It’s a little bit on the heavier side when it comes to nailers, which is a bit of a drag, but it makes up for it with great handling. The grip is a simple no-slip design so you can get a good, comfortable hold on it. This pneumatic nailer has a unique internal piston mechanism that is designed to make sure you get consistent power behind every single shot. It requires 70-120 psi, and it comes with the 360-degree exhaust that we love, keeping debris and fumes away from the work area and away from you. The nose tip is removable, allowing you to safely clear potential jams. It’s a non-marring nose that won’t scuff up the wood you’re using. All in all, this is a powerful nailer that can penetrate any kind of lumber you need for your projects. It’s an ideal nailer especially for people who are newer to the world of carpentry. Hitachi is such a wonderful brand for power tools. It’s known for producing reliable, durable, long-lasting and high-quality products. It’s economical, it won’t cost you over $300 like other nailers, but it will match them in efficiency. The nailer is just 7.5 pounds, making it light and easy to handle. It’s got the great balance that all Hitachi nailers have, and has a sleek frame for getting into those tight spots and firing on an angle. The grip doesn’t stand out, but it doesn’t have to – it does its job well enough that you don’t even have to think about it. The redesigned head guard on the Hitachi NR90AES1 is designed to make assembly and disassembly of the nailer quick and easy so you can take it apart for cleaning and maintenance in record time. It also makes maintenance easier, knowing you can take it apart so thoroughly. The nail gun is designed to be loaded easily. The two-step loading mechanism means you can replenish the 64-nail magazine with ease. If it jams, the nose is designed to allow you to clear it in seconds and go back to driving in nails, so you don’t have to fiddle with it and waste your precious job time. The entire unit is tool-free, including the depth of drive adjustment. And not that it matters, but the black and silver industrial style design does look really good. This is the second Bostitch on our list, because of the quality of the brand name. It’s earned the multiple shout-outs because of that reliability. It’s got an average weight, and a low-profile design that could reach tight spots in-between rafters and other hard to reach areas. The over-molded grip keeps your hand securely wrapped around the handle, and it’s comfortable. This framing nailer features a tool-free select-fire trigger to make the quick switch between bump-fire and sequential firing. All you have to do to switch between the two is flick a simple switch, and you’re in business. The depth-of-drive also has a tool-free adjustment, giving you outstanding versatility and control with your nailer. Contributing to the longevity of Bostitch LPF21PL is the internal air filter, which keeps contaminants from getting in the way of the engine of the nailer, protecting it and keeping it in tip-top shape for years. This is another pneumatic nailer which is capable of delivering 840 inch-pounds of pressure behind every single shot. This nailer is especially appreciated for its versatility and simplicity of use. If you’re doing rafters, this is one unit to strongly consider for its effectiveness with tight spaces. In an attempt to end on a strong note, our last nailer for the list is another cordless Paslode framing nailer. The all-season nailer is efficient and reliable even in temperatures as low as 14 F. The nailer lasts for years and years – and the unit itself isn’t the only thing that has a long life. The 7.4-volt lithium ion battery can pump out up to 9000 nails on a full charge, and even after just a quick 2-minute charge it can still fire off around 200, so this nailer will keep going for as long as you need it. When you don’t have an air compressor and a cord to worry about, you’ll appreciate the genuine versatility of the cordless nailer design. You can take it everywhere, and the body itself isn’t bulky either so it’s easy to squeeze it into those hard-to-reach areas and hit those tough angle shots. The mechanisms of Paslode 905600 CF325XP are made to reduce the chances of jams and misfires, keeping the nailer running smoothly and making it a safe tool to have on hand. 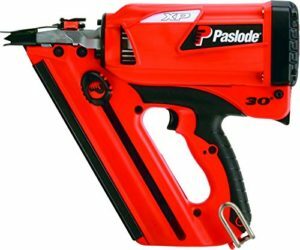 This Paslode is the lightest nailer on our list, which makes a lot of difference in the handling and control of the unit. You won’t have any trouble carrying it wherever you need it. Framing nailers are great for a variety of large carpentry projects. They make your life much, much easier, but you have to be smart when you shop for them. You know now what matters. Find a nailer that is safe, efficient, and long-lasting. You want a tool that has easily adjustable depth-of-drive and trigger settings because you don’t want to waste time or energy on making those adjustments. You want a tool that doesn’t jam easily, and if it does jam you want to be able to clear the jam easily. Essentially, you want a tool that is made to get the job done precisely and without too much hassle. Take your time and think things over before you make your decision, and choose the right nailer for your carpentry job. And remember, if you are working with smaller, thinner materials, you may need a finish or brad nailer instead.